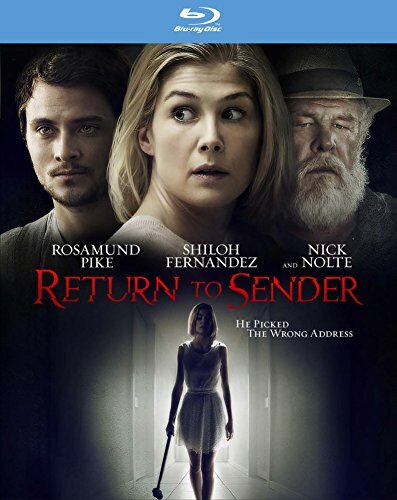 RLJ Entertainment (NASDAQ: RLJE), under the Image Entertainment brand, brings you Return to Sender available on DVD and Blu-ray on September 29, 2015. The film is directed by Fouad Mikati (Operation: End Game) and stars Academy Award Nominee Rosamund Pike (Gone Girl), Shiloh Fernandez (Evil Dead), Academy Award Nominee Nick Nolte (Warrior), Golden Globe Winner Camryn Manheim (ABC's "The Practice"), Rumer Willis (ABC's "Dancing with the Stars", Sorority Row), and Emmy Nominee Illeana Douglas (Grace of My Heart). Return to Sender will be available on DVD for an SRP $27.97 and on Blu-ray for an SRP $29.97. Miranda (Academy Award nominee Rosamund Pike, Gone Girl) is a dedicated nurse, an exquisite cake maker and an impeccable friend. But when she agrees to a blind date and the wrong man comes to her door...her perfect world is shattered by a brutal assault. Even after her attacker, William (Shiloh Fernandez, Evil Dead), is convicted and locked away for the crime, Miranda can't overcome the fear and trauma enough to put her orderly life back together. Desperate for closure, she reaches out to William - first through letters, then prison visits - and slowly builds a relationship with him. But when William is paroled and comes looking for her, Miranda seizes the opportunity to exact revenge. RLJE leverages its management experience to acquire, distribute and monetize existing and original content for its many distribution channels, including its branded digital subscription channels, Acorn TV, Acacia TV, and UMC - Urban Movie Channel, and engages distinct audiences with programming that appeals directly to their unique viewing interests. Through its proprietary e-commerce web sites and print catalogs for the Acorn and Acacia brands, RLJE has direct contacts and billing relationships with millions of consumers. For more information, please visit www.RLJEntertainment.com.